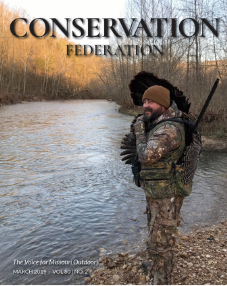 Operation Game Thief (OGT), Missouri’s anti-poaching program, was initiated by a committee made up of members of the Conservation Federation of Missouri. In cooperation with the Missouri Department of Conservation, OGT works to stop the illegal taking of fish and wildlife that includes trophy animals and rare and endangered species. The intent of the program is to put hard-core violators and poaching rings out of business and to make the marginal violators think twice about poaching. OGT works by providing a state-wide, toll-free hotline, reward incentives and a better public understanding of poaching and how to recognize and report violators. If you want to report game/fish violations and cannot reach your local conservation agent, dial toll-free 1-800-392-1111. Missouri Department of Conservation Operaton Game Thief Website. For a brochure on this program, email us.